NWA Democrat-Gazette/CHARLIE KAIJO Riley Laxton, 13, of Rogers (center right) plays with a model skeleton during an eighth grade health class, Thursday, August 9, 2018 at Haas Hall in Rogers. "One of the fields that many of our scholars are interested in is science," said Larry Henry, headmaster, adding that math and science are two of their strongest programs. Haas Hall in Rogers is ranked third in the state for ACT Aspire scores following behind the Haas Hall Fayetteville and Bentonville campuses Henry added. Additionally, Henry said the schools boast a 100 percent acceptance rate in colleges and universities, but does not select students based on any academic criteria. "Some people think itÕs private, some think it costs money. ItÕs a free public charter school," he said. 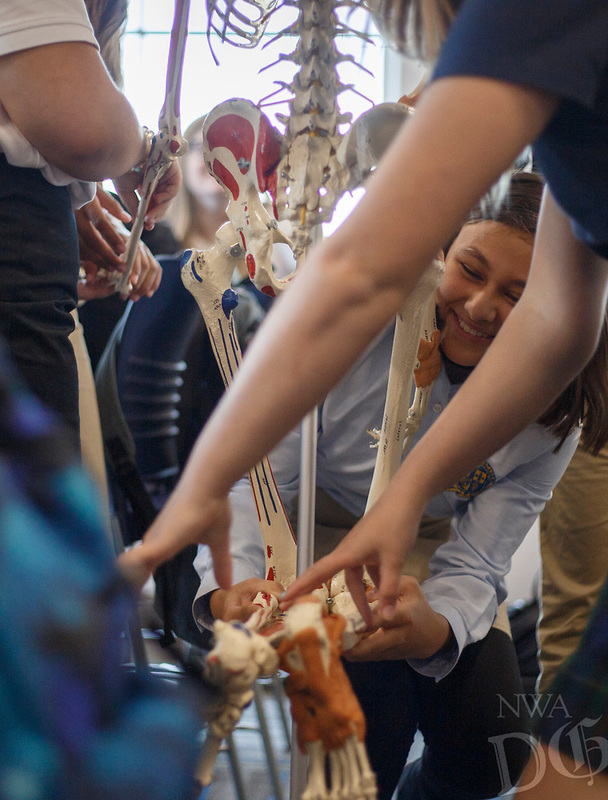 Next year, the Rogers location will welcome its first senior class.NWA Democrat-Gazette/CHARLIE KAIJO Alyssa Jaggernauth, 13, of Rogers (center) plays with a model skeleton during an eighth grade health class, Thursday, August 9, 2018 at Haas Hall in Rogers. Next year, the Rogers location will welcome its first senior class.